—Denise Duncan, RN, UNAC/UHCP President, closing remarks to the #UNACUHCP2018 convention. 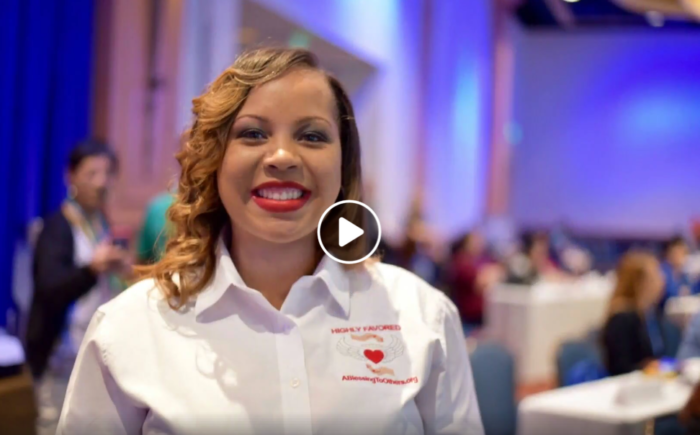 The final day of the convention began with a special recognition for UNAC/UHCP member Alexis Goudeau, RN, Kaiser LAMC, who founded and runs Highly Favored: A Blessing to Others, a charitable organization that performs outreach to the homeless, distributing supplies and resources. UNAC/UHCP partnered with her for last year’s Backpack Friday on the day after Thanksgiving, to distribute 500 backpacks filled with blankets, toiletries and cleaning supplies on downtown LA’s skid row. Watch a video about her work posted on our Facebook page this morning and consider getting involved with this year’s fourth annual Backpack Friday. Tom Steyer addressed the convention next, a wealthy business leader who has become a dedicated activist on a spectrum of interconnected issues: the environment, workers’ rights, income inequality, education and health care. Larry Smith led delegates through an exercise in the power of personal storytelling—in six words. Find some of our delegates best on our Facebook page. Winding up the day and the convention, delegates debated and voted on a few remaining amendments, heard President Duncan’s final remarks and acknowledgments, and watched a video recapping highlights of the entire convention, posted here. Then delegates who’ve given to PEOPLE at the Champion level or above gathered on stage in their black Champion t-shirts for a group photo. Watch a final convention summary video. Watch the slideshow summary from today.